Apparent mineralocorticoid excess (AME) is a severe form of hypertension that is caused by impaired activity of 11β-hydroxysteroid dehydrogenase type 2 (11β-HSD2), which converts biologically active cortisol into inactive cortisone. Mutations in HSD11B2 result in cortisol-induced activation of mineralocorticoid receptors and cause hypertension with hypokalemia, metabolic alkalosis, and suppressed circulating renin and aldosterone concentrations. This study uncovered the first patient with AME who was described in the literature, identified the genetic defect in HSD11B2, and provided evidence for a novel mechanism of reduced 11β-HSD2 activity. This study identified a cluster of amino acids (335 to 339) in the C-terminus of 11β-HSD2 that are essential for protein stability. The cluster includes Tyr338, which is mutated in the index patient, and Arg335 and Arg337, previously reported to be mutated in hypertensive patients. It was found that wild-type 11β-HSD2 is a relatively stable enzyme with a half-life of 21 h, whereas that of Tyr338His and Arg337His was 3 and 4 h, respectively. 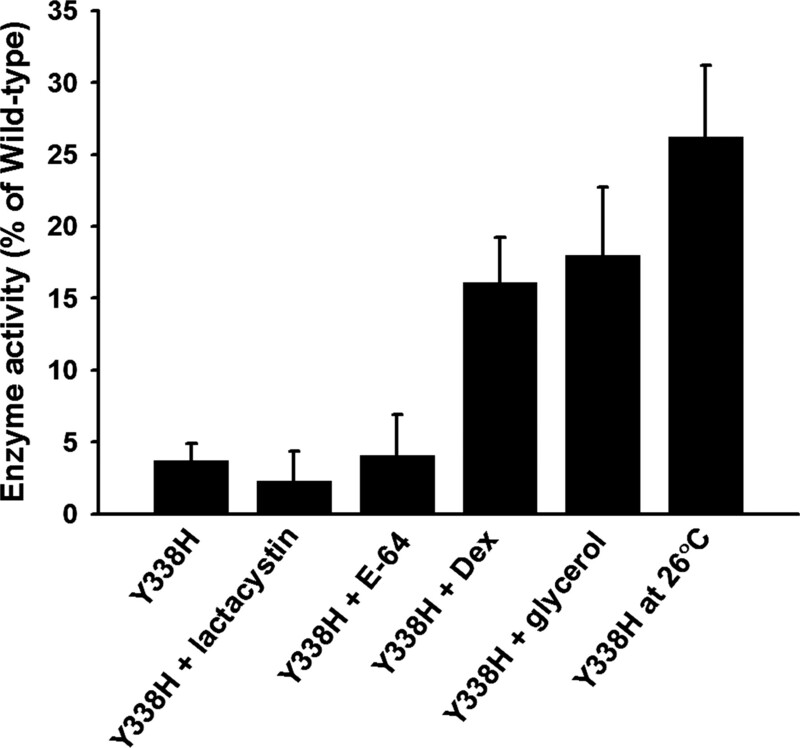 Enzymatic activity of Tyr338His was partially retained at 26°C or in the presence of the chemical chaperones glycerol and dexamethasone, indicating thermodynamic instability and misfolding. The results provide evidence that the degradation of both misfolded mutant Tyr338His and wild-type 11β-HSD2 occurs through the proteasome pathway. Therefore, impaired 11β-HSD2 protein stability rather than reduced gene expression or loss of catalytic activity seems to be responsible for the development of hypertension in some individuals with AME. In the late 1960s, a severe form of hypertension that was characterized by low birth weight, failure to thrive, polyuria, and polydipsia was diagnosed in a 3-yr-old girl (1). The patient had severe hypokalemia, hypernatremia, and metabolic alkalosis despite undetectable plasma renin and reduced plasma and urinary aldosterone concentrations. Plasma cortisol was normal; however, the urinary cortisone metabolite tetrahydrocortisone (THE) was very low. Dexamethasone and spironolactone lowered BP efficiently, suggesting the presence of an unidentified mineralocorticoid. New et al. (2) identified another patient with similar features and coined the term apparent mineralocorticoid excess (AME). Later, genetic defects that cause a functional loss of 11β-hydroxysteroid dehydrogenase type 2 (11β-HSD2), which converts the active 11β-hydroxyglucocorticoid cortisol into inactive cortisone and protects mineralocorticoid receptors (MR) from promiscuous activation by cortisol, were identified as the primary defect in AME (3–5). AME is a rare autosomal recessive inherited form of hypertension, with fewer than 100 cases reported (6). Despite the rarity of monogenic diseases, they represent “extreme situations” that often reveal the key underlying targets and mechanisms of pathophysiologic processes. Inhibition of 11β-HSD2 by endogenous and exogenous compounds can cause sodium retention and hypertension, resembling the features that are observed in AME (7–9). In addition, 11β-HSD2 modulates anti-inflammatory and antiproliferative actions of cortisol (10,11), and placental 11β-HSD2 protects the fetus from high maternal cortisol concentrations, whereby its decreased activity has been associated with reduced birth weight and an elevated risk for cardiovascular diseases in later life (12,13). Despite its importance, most studies that have addressed 11β-HSD2 function focused on transcriptional regulation, and neither protein half-life nor its mechanism of degradation have been elucidated. Here, we investigated the underlying molecular mechanism of the 11β-HSD2 deficiency in the first patient with AME described in the literature (1) and identified compound heterozygosity with a premature stop in exon 1 and the substitution Tyr338His in exon 5. Moreover, we compared the catalytic activities of wild-type 11β-HSD2 and AME mutants Arg337Cys and Tyr338His and investigated their intracellular distribution pattern, protein stability, and half-life. The study was performed according to the guidelines of the local ethical committee. Informed consent was obtained from all participants. The index patient of AME was first described in 1974 (1), but then she refused antihypertensive therapy and was lost to follow-up. She reappeared with end-stage renal failure as a result of untreated severe hypertension and has been on hemodialysis since 2000. At that time, steroid hormone profiles were determined by gas chromatography—mass spectrometry in serum and dialysate as described previously (14–16). Because of the lack of a suitable donor, the patient has not undergone transplantation so far. Renal transplantation is expected to ameliorate the severe hypertension that is caused by cortisol-induced MR activation. However, potential adverse effects as a result of the lack of 11β-HSD2 in vascular cells will not be resolved. Genomic DNA was extracted from peripheral blood leukocytes. The HSD11B2 gene including 1 kb of promoter sequence and all exons and intron-exon boundaries was amplified by PCR and sequenced as described previously (17). Mutations were introduced by site-directed mutagenesis into human 11β-HSD2 with a C-terminal FLAG epitope (18). HEK-293 cells that transiently expressed 11β-HSD2 enzymes were rinsed twice with PBS and resuspended in ice-cold buffer TS2 (100 mM NaCl, 1 mM EGTA, 1 mM EDTA, 1 mM MgCl2, 250 mM sucrose, and 20 mM Tris-HCl [pH 7.4]). Aliquots were sonicated; lysates were diluted in TS2 buffer (4°C); and reactions were carried out in a final volume of 20 μl that contained 10 nCi of radiolabeled cortisol or corticosterone, 400 μM NAD+, and various concentrations of unlabeled steroid. Incubation was for 10 min at 37°C. Steroids were separated by thin-layer chromatography, and the conversion was determined by scintillation counting. 11β-HSD2 activity was measured in intact transfected cells after they were seeded in poly-D-lysine coated 96-well plates (25,000 cells/well) 24 h before the assay. The medium was removed, followed by addition of 40 μl of fresh medium and 10 μl that contained 10 nCi of radiolabeled cortisol or corticosterone and unlabeled corticosterone (20 to 500 nM) or cortisol (50 to 2000 nM). Reactions were incubated for 2 to 12 h at 37°C under 5% CO2. Kinetic analyses were performed by nonlinear regression using Data Analysis Toolbox (Elsevier MDL, San Ramon, CA), assuming first-order rate kinetics. A rabbit polyclonal antibody against the C-terminal region was raised by four subcutaneous injections of a glutathione S-transferase–fusion protein that contained residues 263 to 405 of human 11β-HSD2. The antibody selectively recognizes 11β-HSD2, without cross-reaction with 11β-HSD1, in immunohistochemistry and immunofluorescence experiments. The use of this antibody for Western blotting is limited because of the weak signal obtained. Immunofluorescence experiments with transfected HEK-293 cells were performed as described previously (19). 11β-HSD2 was detected by rabbit polyclonal anti–11β-HSD2 antibody or mouse mAb M2 (Sigma-Aldrich, Buchs, Switzerland) against the C-terminal FLAG epitope and secondary ALEXA-488 anti-rabbit or anti-mouse IgG (Molecular Probes, Eugene, OR). After washing, nuclei were stained with DAPI and mounted using the Slow-Fade Antifade kit (Molecular Probes). Samples were analyzed on an Eclipse E600 fluorescence microscope (Nikon, Egg, Switzerland). Total cellular proteins (30 μg/lane) were subjected to SDS-PAGE and Western blot analysis using anti-FLAG antibody M2 and secondary horseradish peroxidase–conjugated goat anti-mouse IgG (BioRad, Hercules, CA). The endogenous control actin was detected with anti-actin goat polyclonal IgG (sc-1616; Santa Cruz Biotechnology, Santa Cruz, CA). Antibody binding was visualized using enhanced chemiluminescence Western-Blotting detection reagents (ECL Plus; GE Healthcare Europe, Otelfingen, Switzerland). For inhibition of protein synthesis by cycloheximide, transfected HEK-293 cells were grown in six-well plates for 24 h. Cells were washed once with PBS, and fresh medium that contained 50 μg/ml cycloheximide was added. At various time points, aliquots were taken and 11β-HSD2 protein was detected by immunoblotting. The effect of protease inhibitors on the expression of wild-type 11β-HSD2 and mutant Tyr338His was studied by incubation of cells with the corresponding inhibitors in the presence of 20 μg/ml cycloheximide. Cells were incubated for an additional 6 (Tyr338His) or 15 h (wild-type 11β-HSD2), washed once with PBS, and snap-frozen at −20°C, and 11β-HSD2 protein was quantified by immunoblotting. For determination of protein half-life, cells were washed once and incubated in leucine-free DMEM (MP Biomedicals, Illkirch, France) for 30 min to deplete endogenous leucine. The medium was then replaced by 2 ml of leucine-free DMEM that contained 20 μCi/ml l-leucine-[3,4,5-3H(N)], and cells were incubated for 3 h. The labeling was stopped with 5 mM unlabeled leucine, followed by washing and incubation in normal DMEM. After various time intervals, samples were snap-frozen and subjected to immunoprecipitation of FLAG-tagged wild-type and mutant 11β-HSD2 using EZview Red ANTI-FLAG M2 Affinity gel according to the manufacturer's instructions (Sigma-Aldrich). Eluted proteins were analyzed by scintillation counting or separation by SDS-PAGE, drying the gel, exposure to tritium-sensitive screens, and detection of the radioactivity using a Cyclone PhosphorImager (Packard Instruments, South San Francisco, CA). At age 40, the patient reappeared with ESRD and subarachnoidal hemorrhage. We reinvestigated the steroid hormone metabolites both in plasma and in dialysate (Table 1). Because the kidney is the main site of 11β-HSD2 expression, total body 11β-HSD2 activity is reduced in hemodialysis patients (14,15) and remaining activity may originate mainly from colon and vascular endothelial cells (20). In this patient, cortisol concentrations in plasma and dialysate were in the same range as those in patients who were on hemodialysis (14,15). In contrast, cortisone levels were significantly decreased, resulting in the elevated ratios of cortisol to cortisone that typically are observed in patients with AME. Reduced cortisone levels were further reflected in dialysate by low concentrations of cortisone metabolites and significantly elevated ratios of (tetrahydrocortisol [TFE] + 5α-THF)/THE and (α-cortol + β-cortol)/(α-cortolone + β-cortolone; Table 1). These observations suggested severe 11β-HSD2 deficiency and indicated, for the first time, that AME can be diagnosed on the basis of the steroid profile in patients who are on hemodialysis. The exons, intron/exon boundaries, and 1500 bp of 5′-untranslated region of HSD11B2 were amplified by PCR and sequenced. Genetic analysis revealed compound heterozygosity with a deletion in exon 1 of two nucleotides (CA), thereby changing TCA for Ser26 to the premature stop TGA, and a single nucleotide substitution T to C in exon 5, changing TAT for Tyr338 to CAT coding for His. Both mutations were absent in 300 control chromosomes. The normotensive brother of the patient was heterozygous for Tyr338His in exon 5, whereas exon 1 was intact. The oxidation of cortisol and corticosterone by wild-type 11β-HSD2 and mutants Arg337Cys and Tyr338His was measured in intact HEK-293 cells, and comparable apparent Km values were obtained (Table 2). The five- to 10-fold higher apparent Km values for cortisol compared with corticosterone have been observed in previous studies (17,21). Whereas mutant Arg337Cys exhibited approximately 60% of wild-type activity, in line with previously reported results with this mutant in CHOP cells (21,22), the newly identified mutation in the neighboring amino acid—Tyr338His—showed <5% of wild-type activity with both substrates. It is interesting that catalytic activity of both mutant enzymes was completely abolished upon cell lysis, indicating a similar inhibitory mechanism. Two earlier studies found higher 11β-HSD2 activity in the presence of the reducing agent dithiothreitol in cell lysates (23,24). In our experiments, the addition of dithiothreitol to cell lysates did not alter the activity of wild-type 11β-HSD2 or Tyr338His. Western blotting and detection with an anti-FLAG antibody revealed that the expression levels of mutants Tyr338His and Arg337Cys per total cellular protein were approximately 70 and 45% lower than that of wild-type 11β-HSD2 (Figure 1). When adjusting enzyme activities for the signals that were obtained in semiquantitative analyses of immunoblots, the activity of Arg337Cys was comparable with that of wild-type enzyme, whereas that of Tyr338His was still approximately six-fold lower. Expression of wild-type 11β-hydroxysteroid dehydrogenase type 2 (11β-HSD2) and apparent mineralocorticoid excess (AME) mutants Tyr338His (Y338H) and Arg337Cys (R337C). Wild-type and mutant 11β-HSD2 constructs with a C-terminal FLAG epitope were transiently expressed in HEK-293 cells and analyzed by Western blotting using anti-FLAG antibody. (Top) Semiquantitative analysis of immunoblots from four independently performed experiments (means ± SD; **P < 0.01). (Bottom) A representative experiment is shown. Despite low C-terminal sequence identity among different species, the Arg/Tyr-rich cluster at residue 334 to 343 of human 11β-HSD2, with the consensus sequence Pro-Arg-Arg-Arg-Tyr-Tyr-Pro-Gly-Xaa-Gly, is highly conserved. The residues shown in italic are not fully conserved throughout all species. Arg335 is replaced by Gln in horse and some fish species, Arg336 by Pro in rabbit, Ser in mouse and rat, and Val in some fish species, and Tyr339 is conserved in all species except tilapia, which has Phe. Pro340 is substituted by Thr in rat and Ala in some fish species. Importantly, Arg337 and Tyr338 are found in all species analyzed so far. The homozygous mutations Arg337Cys and Arg337His,ΔTyr338 have been found in other patients with AME (3,5), and the heterozygous substitution Arg335His was recently found in a hypertensive woman (25), who was not hypokalemic like typical patients with AME. The role of this region for 11β-HSD2 function remained unclear. To assess further the role of the side chain of each residue in the arginine/tyrosine cluster at positions 335 to 339 of human 11β-HSD2, we used site-directed mutagenesis and determined the catalytic activity of each mutant enzyme in cell lysates (Figure 2). Tyr338 turned out to be absolutely essential for enzyme activity, and all three substitutions were completely inactive. The loss of function of Tyr338Phe indicates an essential role of the Tyr-hydroxyl for 11β-HSD2 activity. At position 339, substitution of Tyr by Phe or the weak basic residue His resulted in enzymes with approximately 40% of wild-type activity. Ala with a methyl side chain was less favorable, showing 20% of wild-type activity. Replacement of Arg335 by Lys did not significantly alter enzyme activity, whereas Gln and Ala were less active, indicating that the positive charge at position 335 is important but the steric differences between the side chains of Arg and Lys can be tolerated. At positions 336 and 337, substitution of Arg by Lys resulted in enzymes with 30 to 40% of wild-type activity, whereas substitution to Gln or Ala resulted in enzymes with very low activity, indicating that the positive charge, size, and shape of the side chain are important. Mutational analysis of the stability cluster at residues 335 through 339 of human 11β-HSD2. The activities of wild-type and mutant enzymes to convert various concentrations of corticosterone to 11-dehydrocorticosterone were determined in cell lysates. The plot represents apparent Kcat of mutant enzymes relative to wild-type 11β-HSD2 (set as 100%). The mutations that were derived from patients with AME are underlined and in boldface type. Amino acids are indicated by the single-letter code. Data are means ± SD from three independent experiments. Both mutant Arg337Cys and Tyr338His displayed decreased enzyme activity and expression levels compared with wild-type 11β-HSD2. Their activity was completely lost upon cell disruption, indicating that the reduced activity is not due solely to reduced expression. Analysis of the subcellular distribution revealed a typical endoplasmic reticulum membrane pattern for wild-type 11β-HSD2, whereas mutant Tyr338His was localized mainly in perinuclear bodies (Figure 3), a pattern that is typical for thermodynamically unstable and misfolded proteins (26). Although the expression level of mutant Tyr338His was still approximately 30% of that of wild-type enzyme (Figure 1), most of the mutant protein seemed to be misfolded and formed aggregates, explaining the very low activity detected in intact cells (Table 2). An analysis of the expression pattern in cells that were grown at 26°C revealed an almost normal distribution of mutant Tyr338His with a low level of aggregate formation, indicating temperature sensitivity of the mutant enzyme with a higher amount of functional and properly folded mutant proteins at lower temperature (Table 3). Comparable results were obtained using either rabbit polyclonal anti–11β-HSD2 antibody or mouse monoclonal M2 anti-FLAG antibody. Subcellular distribution of wild-type 11β-HSD2 and AME mutant Tyr338His (Y338H). The localization of wild-type and mutant enzymes, expressed in HEK-293 cells, was determined 24 h after transfection using a primary rabbit polyclonal anti–11β-HSD2 antibody and secondary ALEXA-488 anti-rabbit mouse mAb. The nucleus was stained with DAPI. The samples were analyzed by fluorescence microscopy, and pictures represent one of three independent and comparable experiments. The apparent affinity (Km) of mutant Tyr338His for cortisol and corticosterone was comparable with that of wild-type enzyme (Table 2), indicating that the mutation did not affect the affinity of the enzyme for its substrate. However, even when its three- to four-fold lower expression was taken into account, Tyr338His was still six- to eight-fold less active (Kcat) than wild-type 11β-HSD2, suggesting lower Vmax or reduced protein stability as a result of the formation of aggregates of inactive mutant protein. Upon growing cells at 26°C, the activity of Tyr338His was approximately 25% of that of the wild-type enzyme (Figure 4), whereas its expression, as determined by semiquantitative Western blotting, was still three to four times lower than that of wild-type 11β-HSD2. Although the estimation of the protein amounts is only semiquantitative, it suggests that Tyr338His and wild-type 11β-HSD2 have comparable Km and Vmax values and that the reduced activity of the mutant enzyme is due primarily to reduced protein stability. Stabilizing effect of chemical chaperones and low temperature on the activity of mutant Tyr338His (Y338H). Cells that expressed AME mutant Tyr338His were incubated for 24 h at 37°C with 10 μM lactacystin, 100 μM E64, 1 μM dexamethasone (Dex), or 5% glycerol or were incubated at 26°C, followed by determination of enzyme activity in intact cells in the presence of 20 nM corticosterone. The increase in Tyr338His enzyme activity at 26°C or in the presence of glycerol or Dex compared with activity at 37°C was statistically significant (P < 0.05). The function of some thermodynamically unstable proteins can also be recovered in the presence of chemical chaperones (i.e., low molecular weight compounds), such as the cellular osmolytes glycerol and trimethylamine N-oxide, that are able to stabilize nonspecifically the native conformation of many proteins. A substantial amount of enzyme activity was recovered upon expression of Tyr338His in cells that were grown in the presence of 5% glycerol. It has also been shown that ligands and inhibitors that specifically bind to a protein, so-called pharmacologic chaperones, often stabilize active enzyme conformations (27). Incubation of cells with 1 μM dexamethasone, a substrate of 11β-HSD2 (28), significantly enhanced the expression of active Tyr338His. In contrast, inhibitors of protein degradation, including 10 μM of the proteasome inhibitor lactacystin or 100 μM of the lysosomal degradation inhibitor E-64, failed to increase enzyme activity, suggesting accumulation of misfolded and inactive proteins. We investigated the stability of wild-type 11β-HSD2 and mutant Tyr338His by incubating cells with 50 μM cycloheximide for 0, 6, and 21 h, followed by immunodetection using anti-FLAG antibody (Figure 5A). Whereas the protein level of wild-type 11β-HSD2 after 21 h of inhibition of protein synthesis was unchanged, a rapid decline of Tyr338His protein was observed, suggesting that wild-type 11β-HSD2 is a relatively stable protein, whereas mutant Tyr338His is a short-lived enzyme. Cycloheximide does not fully block de novo protein synthesis, and its toxicity can lead to erroneous results. Therefore, we used the more sensitive pulse-chase technique and analyzed labeled proteins by immunoprecipitation using anti-FLAG antibody-coated beads and scintillation counting (Figure 5B) or separation by PAGE and autoradiographic analysis (Figure 5C). From these experiments, a half-life of 21 and 3 h was estimated for wild-type 11β-HSD2 and mutant Tyr338His, respectively. Despite relatively high activities of Arg337Cys with cortisol and corticosterone in intact cells and a subcellular distribution pattern in HEK-293 cells comparable with that of wild-type 11β-HSD2, this mutant lost its activity upon cell disruption, indicating impaired protein stability. Perinuclear accumulation of Arg337Cys was observed in some cells 48 and 72 h after transfection (data not shown). The half-life of Arg337Cys (4 h) was only slightly longer than that of mutant Tyr338His (3 h), suggesting that impaired stability is responsible for the reduced renal cortisol inactivation in patients who have AME and bear these mutations. 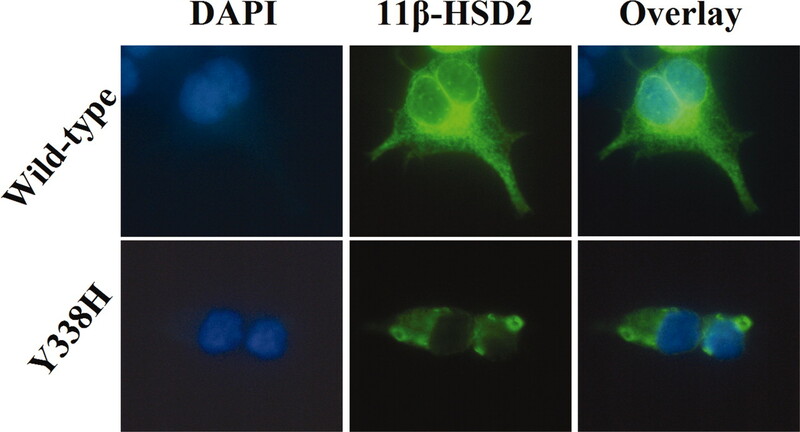 Analysis of 11β-HSD2 protein stability. C-terminally FLAG-tagged wild-type 11β-HSD2 and mutant enzymes were expressed in HEK-293 cells. (A) After 24 h after transfection, cells were incubated with 50 μg/ml cycloheximide to inhibit de novo protein synthesis. After 0, 6, and 12 h of treatment, cells were harvested, followed by semiquantitative analysis of the amount of 11β-HSD2 protein by immunoblotting using anti-FLAG antibody. (B and C) The protein half-life of 11β-HSD2 was determined by pulse-chase experiments using tritiated l-leucine to label proteins, followed by washing and incubation in medium with unlabeled leucine for various times. The amount of protein was determined by immunoprecipitation using anti-FLAG antibody-coated agarose beads and quantification of the radioactivity by scintillation counting (B) or by separating proteins on SDS-polyacrylamide gels, drying the gels, and exposing them to a tritium-sensitive screen for detection of the radioactivity using phosphor-imaging (C). (D) The effect of protease inhibitors on the degradation of wild-type 11β-HSD2 and mutant Tyr338His (Y338H) was assessed in cells that were treated with 20 μg/ml cycloheximide to inhibit de novo protein synthesis and vehicle, 10 μM lactacystin, 10 μM MG132, 100 μM chloroquine, or 100 μM E64. The incubation time was 6 h for mutant Tyr338His and 15 h for wild-type 11β-HSD2. 11β-HSD2 protein was detected by immunoblotting. (A, C, and D) One of three comparable experiments is shown. (B) Data are means ± SD from three independent experiments. To study the mechanism of degradation, we incubated cells that expressed wild-type 11β-HSD2 or mutant Tyr338His with cycloheximide to stop protein synthesis and various protease inhibitors. Cells that expressed wild-type enzyme or mutant Tyr338His were lysed after 15 and 6 h, respectively, followed by immunodetection (Figure 5D). The inhibitor of lysosomal cysteine proteinases E-64 (100 μM) and the lysosomal acidification inhibitor chloroquine (100 μM) had little or no effect on 11β-HSD2 degradation. In addition, the mixed inhibitor of calpain and lysosomal protease E-64b (50 μM), the calpain inhibitor calpastatin (5 μM), the inhibitors of trypsin-like and chymotrypsin-like proteases Nα-tosyl-l-lysine chloromethyl ketone hydrochloride (100 μM) and Nρ-tosyl-l-phenylalanine chloromethyl ketone (50 μM), as well as NH4Cl (20 mM), which inhibits lysosomal acidification, did not affect 11β-HSD2 degradation (data not shown). In contrast, the proteasomal inhibitors MG132 (10 μM) and lactacystin (10 μM) inhibited the degradation, suggesting that the expression levels of both wild-type 11β-HSD2 and misfolded mutant Tyr338His are controlled by the proteasome pathway. The investigation of the genetic defect in this patient with first phenotypically diagnosed AME revealed a novel mutation that caused a premature stop in one allele and led to the identification of a cluster of five Arg/Tyr residues at position 335 through 339 in the other allele. Subtle changes in charge and size at the side chains of residues 335 through 339 resulted in reduced stability and abolished enzyme activity, indicating that the C-terminal region of 11β-HSD2 plays an important role for protein function. 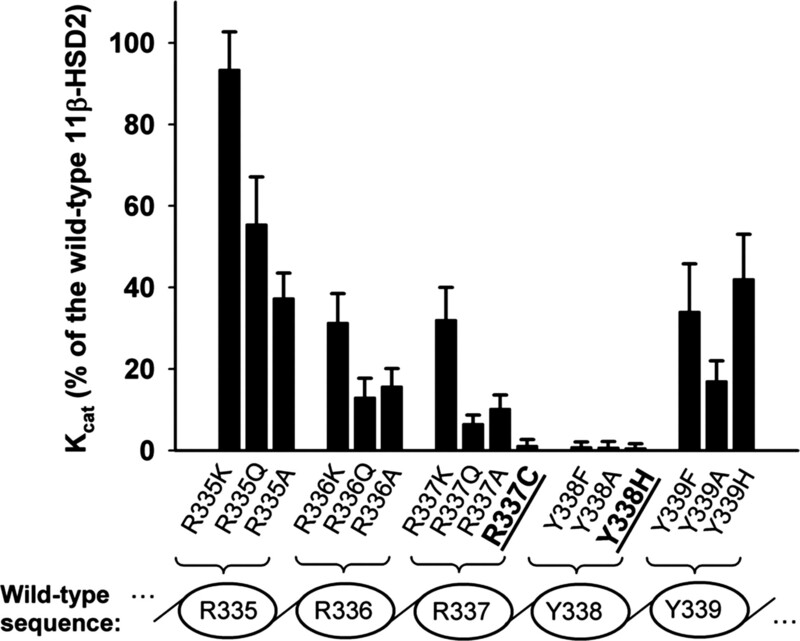 Site-directed mutagenesis revealed that Tyr338 is most sensitive to changes in the side chain, suggesting an important role of its hydroxyl residue for enzyme activity. AME mutant Tyr338His was less stable, showed a higher tendency to form aggregates, and was more rapidly degraded than Arg337Cys. Previous observations provided evidence for a reduced stability of Arg337Cys, but they suggested that a 10-fold lower substrate affinity may be the cause of AME (22,29). In this study, we found no significant loss of substrate affinity, indicating that the defect of enzymes mutated at residues 335 through 339 is due primarily to impaired protein stability. Impaired protein stability might be responsible for the functional defect of other 11β-HSD2 mutants, including Ser180Phe, AL237Val, and Ala328Val, suggesting that additional regions are important for proper stability of 11β-HSD2 (30). A normal intracellular distribution pattern and little or no effect on kinetic properties were observed upon expression of mutant enzymes at low temperature or in the presence of chemical chaperones. Dexamethasone can be used, as was the case for a short period in our patient, for the treatment of AME to suppress the endogenous production of cortisol (31). In addition, our results suggest that dexamethasone acts as a pharmacologic chaperone in patients who have AME with mutations in the Arg/Tyr cluster by stabilizing mutant enzymes and increasing the number of functional 11β-HSD2 enzymes. It can be speculated that posttranslational modifications of Tyr338 and Tyr339 by phosphorylation or nitrosylation might label the enzyme for degradation by the proteasome pathway. Our results provide the first evidence that both wild-type and mutant 11β-HSD2 enzymes are degraded by a proteasome-dependent mechanism. The relevance of proteasome-dependent degradation of wild-type 11β-HSD2 should be further investigated. For instance, an enhanced degradation of 11β-HSD2 by the proteasome pathway would result in a local increase of active glucocorticoids. Recently, increased proteasome activity was associated with enhanced inflammation in patients with symptomatic carotid disease (32) and with a role in the response to microbial stimuli such as LPS, bacterial DNA, and peptidoglycan (33,34). Whether reduced 11β-HSD2 protein stability as a result of increased proteasome activity might contribute to glucocorticoid-dependent activation of corticosteroid receptors in kidneys and colon during inflammation or in placenta during maternal stress remains to be elucidated. Although AME is a rare inherited form of hypertension with fewer than 100 cases reported so far (6), it is important to note that approximately 40% of patients with essential hypertension display signs such as low plasma renin activity, a positive correlation between BP and serum sodium concentrations, or a negative correlation between BP and serum potassium levels, resembling glucocorticoid-mediated MR activation as a result of impaired 11β-HSD2 activity. Moreover, a significantly increased plasma half-life of cortisol and higher excretion of urinary cortisol metabolites as well as elevated cortisol-mediated vasoconstrictor response were observed in a subset of patients with essential hypertension (35,36). In addition, several studies showed an association of reduced 11β-HSD2 activity with salt sensitivity (7,37). These studies suggest that impaired 11β-HSD2 activity plays a role in a subgroup of patients with essential hypertension. In addition to the presence of inhibitors or reduced transcriptional expression, we propose that impaired 11β-HSD2 protein stability may contribute to glucocorticoid-induced MR activation and hypertension. We demonstrated that reduced 11β-HSD2 protein stability can cause low renin and low aldosterone hypertension and provided evidence that 11β-HSD2 is degraded by a proteasome-dependent mechanism. We hypothesized that impaired 11β-HSD2 protein stability, as a result of mechanisms other than genetic defects, including posttranslational modification of 11β-HSD2 and impaired proteasome activity, may be the underlying mechanism in a subset of patients with hypertension that is caused by glucocorticoid-induced MR activation. This work was supported by grants from the Cloëtta Research Foundation and the Swiss National Science Foundation (grants 310000-112279 to A.O. and 3100A0-102153 to F.J.F.). Parts of the results were presented as a poster at the annual meeting of the American Society of Nephrology; November 14 through 19, 2006; San Diego, CA. We thank Heidi Jamin for excellent technical support and Dr. Anita Stauffer for antibody production. P.F. 's current affiliation is Department of Nephrology, Fremantle Hospital, University of Western Australia, Perth, Western Australia, Australia.